March 22, 1997: Chris Drury's goal at 12:20 of overtime gave Boston University a 4-3 win over Denver in the NCAA East Regional Final in Worcester. The second-seeded Terriers (Clarkson was the #1 seed) had taken a 3-2 lead with 3:19 left in regulation on Shawn Bates' shorthanded breakaway goal. However, the Pioneers forced overtime with an extra-attacker goal by Eric Anderson, beating Michel Laroque with 53 seconds left. In the overtime, skating 3-on-3, Chris Kelleher took a pass from Jon Coleman and fired a shot from the left point. Drury was locked up with a Denver defender in front of the net, but gained control and slid the rebound past tournament MVP Jim Mullin and then leaped into the glass in celebration. Drury's goal was his 37th of the season. BU hadn't won a game all season in which Drury didn't get a point and he'd been held scoreless in regulation. Current associate head coach Albie O'Connell scored the first two goals for BU, which would go on to upset defending champion Michigan in the Frozen Four semis before losing to North Dakota in the final. 2016 recruit Clayton Keller was the draft prospect guest on Monday Night's edition of The Pipeline Show. His interview begins at the 16 minute mark. 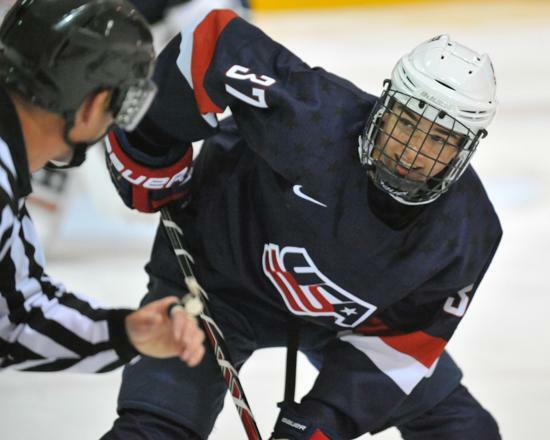 Keller, who leads the NTDP U18s with 85 points, was ranked #8 among North American skaters in the NHL Central Scouting midterms.